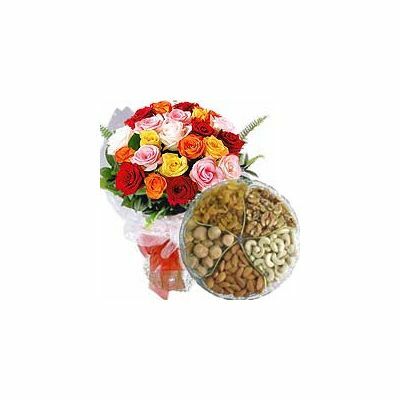 What can be a better gift than colorful roses and assorted dry fruits? Our Mixed Dry Fruits Combo is a special treat for the special person. Mixed Dry Fruits Combo consists of an attractive bouquet of 24 multi colored roses tastefully decorated by our expert florist and a ½ kg tray of assorted dry fruits. 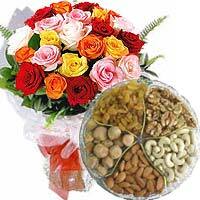 Send roses bouquet online along with the mixed dry fruits to your loved ones on special occasions and festivals. The Mixed Dry Fruit Combo makes a wonderful thank you gift to a special colleague, friend or boss.We offer free same day delivery and home delivery service.